I have a side job helping write monthly newsletters for a doctor’s office here in town. I love creating content, and deciphering notes and pulling together a multitude of sources into one space that serves as an educational resource for those seeking to improve their health. A couple of weeks ago, feeling rushed to meet a deadline, I ticked off a quick couple lines of introduction copy for this month’s newsletter and sent it to my colleague. “How is this for an introduction?” I typed in the notes, and waited for her feedback. My tone had been pessimistic – February is a drag – something to get through – too much snow – and every once in awhile – we need a boost. No sooner had I clicked send did the doctor call me, with kindness and laughter in her voice. “That intro was a drag Katie!” she exclaimed. “Let’s turn that tone upside down.” At first I was a little offended, but as I sat and listened to her vision for her correspondence with clients, my defense softened. The doctor went on to encourage me to encourage others – to find the joy and beauty in this month of February. Her redirection inspired me in remembering that our words are what create our reality – our intentions and tone are powerful. When we choose to share that writing, we have the power to influence other’s moods, attitudes, and perceptions. This conversation changed my month, and it changed my heart. I’ve sense rewritten the introduction, and while it felt a little cheesy to try to find the positive, the doctor’s words continue to reverberate through my mind. We can find beauty and optimism when we go looking for it, and maybe, even more powerfully, when we create it. This week I attempted to create beauty in several situations. Call it simple, but for Valentine’s Day I made my very own cheese danish pastry. While the holiday was on a Sunday, and we chose not to over indulge in any romantic dates, I did want to create a little festivity in my own house. I rolled out of bed, and followed this recipe to bring a little bit of celebration to our lazy Sunday morning routine. Routine? Does sleeping ’til 10 am count as a routine? Cream cheese and sugar, vanilla and raspberries – when these ingredients blend together they create beautiful flavors and a sense of fancy that just made me smile. Sunday also presented us with the choice to run errands, and use up gift cards lingering in our junk drawers from Christmas. I went to Nordstrom Rack and got a pair of pants for nine dollars. NINE DOLLARS. I love a beautiful bargain. I tried Maintenance Moment at my favorite brewery – which perfectly pairs the light flavors of coffee with beer. Their full description is so much more delightful. Hello Colorado! You’ve achieved a combination of my favorite things. Is it bad to proclaim craft beer as one of your favorite things on the internet? Not sure, let’s take a beautiful risk. So this week I give a nod to the universe as several loved ones have lifted my chin, and reminded me to look for the beautiful with optimism and hope in my heart. May you find and create beauty at every turn, even if it involves a roll of crescent dough. I’m sorry to report this is the first week in my two year journey that I haven’t written a post. I am knowing my limits and saying I can’t commit this week. Beauty in saying, “Sorry, not sorry.” I’ve got to take a break. Until next week. Keep up the search. I am not in school right now. Days in May have blended into days in August and all of the sudden I catch myself thinking, ok kids head back to school soon. No, not my kids. I do not have children. The general populous of American children will be banging their backpacks into lockers and crumpling up half sheets of yellow paper that were meant for parents eyes in just a few weeks. We do not have cable right now, so the back to school commercials are missing and I do not have an excuse to buy new pens and pencils and notebooks – fine point Pilot brand please. It is odd, once in the working world, how summer seems to escape you. We have been to quite a few weddings, and played tennis outdoors and tried new cooking adventures on the grill, but summer as a working adult, does not have exactly the same charm as it does when you are fifteen, or eighteen, or even twenty-two. This week, I made it a point to start observing the things that I want to capture before the long evenings turn to fall (oh fall, I love fall. Hurry up sweater weather). No, that’s missing the point. I am captivated by the sights and smells that remain of the summer. The season is not quite over. We have baseball games to go to, hikes to take, birthdays to celebrate and maybe since we won’t squeeze camping in we can sleep in the backyard. This weekend I tried something new. Pizza on the grill! What a fun idea. Pizza dough at Whole Foods only costs $2.99. We received this cookbook back in early spring and hadn’t gotten around to implementing the nuggets of scrumptious, creative ideas. Saturday was the day for a foodie adventure and I was so proud of our creations. Thanks to Cathy for your grilling wisdom and moral support. 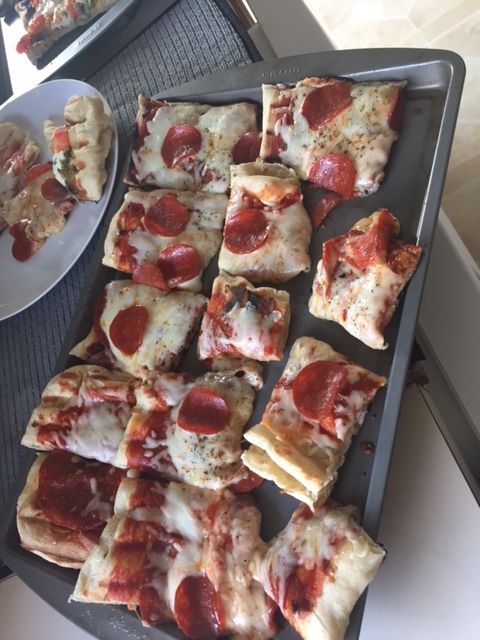 If you are looking for a great way to cook something scrumptious without heating up the house, give pizza on the grill a try. Grill lines and the smell of charred dough are actually quite enchanting when paired with a summer breeze. It’s on a cookie sheet I know. I promise we used the grill! Peach lady is here! I wrote about my love for the August peach last year here. My thoughts have not changed much regarding these delectable globes of juiciness and when Debbie the peach lady rolled into town I couldn’t wait for my mom to buy a box. Note – I’m too cheap to buy my own palette of grown fruit. I had my first taste of the season last night, standing over the sink, as I watched a movie with my parents in their dimly lit kitchen. Before I bit into the furry skin, however, I raised the fruit to my nose and inhaled. You can actually smell the ripe, real fruit in a way that only nature can intend. When you smell fruit in the grocery store you experience no such beauty. The same is true of the tomatoes growing in my pots in the back yard. I went out to water tonight, and picked off a few branches on the tiny plants that are not producing any blossoms. The smell of tomato leaves seeped onto my hands – green, fresh, delightful. Once again, not an experience you get at the grocery store. There is beauty in stopping to smell the bounty of goodness we are blessed to receive. Literally the fruits of our own existence. Popsicles are pretty darn beautiful too. No, don’t smell those. Those come from the grocery store. No really, watch it. What do you take away from these silly clay creatures and their love for one another? When I watched the video at first, I was upset. What do those little monsters have to do with the world going at tornado pace when all I wanted to do was sit and let the lyrics woo me into a comfortable trance. I believe I’ve discussed The Weepies before, and I’m sure I’ll reference them again. Maybe a year or so ago I even referenced this very song. If so, I apologize for my redundancy. The truth that this band communicates is too poignant not share. As I walk through my weeks and follow my routine, I feel something tugging on me to stop and look up, for yes, The Weepies are right, the world spins madly on. Quickly and with gail winds and blushing breezes we jump from to-do list tasks to the hop scotch of frantic completion of the next best thing. I stopped myself this weekend, and said, No, I refuse to live this way. There is always going to be another problem to solve, solution to master, load of laundry to do. So, instead, I slept in and I took a nap – both in the same day! Oh the sloth, the laziness of rest. Raise your hand if you feel guilty for taking a rest! I know, I know. I do this to myself. My yoga teacher started class tonight by praising us for carving time out of our days to take care of ourselves. When you hear the word carve, what do you think? I think of stone, and wood, and sharp tools, and precise effort that lends towards something beautiful. However, the word carve and the words ease, or flow or grace do not seem to go together for me. Why should it be so difficult to give ourselves the grace to enjoy a yoga class, to take a moment to consciously stretch our limbs and breathe. True confession – I caught myself looking at the clock at 6:15 and hoping the class would hurry along. I have things to do, blogs to write, meetings to be held. Tsk, tsk to me. I was not the first to roll up my mat and put away my props at the end of class. Other people had things to move onto as well. That’s why they call it yoga practice, right? This whirlwind of a week brought pleasant, beautiful surprises as I was rushing from work to home to life. I am thankful for a three day weekend, for fireworks, for freedom, for rest. I am thankful for watermelon. Oh watermelon, why can’t you be this deliciously juicy all year long? As I bought dinner tonight at the local grocery store, I stopped to eat by myself in the brief pause before meetings. I looked up from my phone and noticed two women sitting and practicing French. One woman was my age, the other older than my mom, and they were both practicing their language skills. I caught myself listening, despite not knowing more than three words of French myself, and was drawn in to their beautiful practice in working on a new skill in relationship with another. The artwork hanging on the wall above their heads was so intriguing. Two tables down, a father was feeding his little toddler mac and cheese, and two boys fighting over a banana argued their way to the trash can hoping to be the one to throw the peel in the bucket. Parents were barely hanging on as their days were coming to an end. I got to share that space with all of these individuals as they rushed madly to the next anticipated moment of rest. Mindfulness and raising my head from my silly iPhone screen can be beautiful. I miss a lot if I stay wrapped up in the whirlwind. To the women sharing a conversation in French at Whole Foods, thank you for reminding me to stop and look for the little things. I wish I had been brave enough to ask for your names.